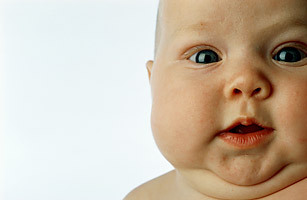 Is There an Obesity Tipping Point in Infancy? If there is any reason for hope among the data on national obesity rates in the U.S. (the numbers should be familiar by now: two-thirds of adults and nearly one-third of children are overweight or obese in the country), it is that they finally seem to be leveling off. According to the most recently published reports by epidemiologists at the Centers for Disease Control and Prevention (CDC), long-term federal obesity data suggest that after decades of ballooning in size, American adults and children may have gotten about as fat as they're ever going to get. Of course that still means that the majority of Americans are currently overweight and at high risk of chronic health problems, such as heart disease, diabetes and certain cancers. These risks continue to propel several national campaigns aimed at preventing obesity, particularly in children, including those spearheaded by First Lady Michelle Obama and former President Bill Clinton. But some researchers say such programs, which involve school-age children, may begin too late to benefit all children. Increasingly, evidence suggests that obesity-prevention measures need to be taken earlier, in infancy or even before birth. According to the CDC's National Health and Nutrition Examination Survey, rates of obesity in youngsters ages 2 to 5 have more than doubled since 1980, from 5.0% to 12.4%. And once a child sets down the road to an unhealthy weight, it becomes increasingly difficult for him to change course: according to one study, 80% of children who are overweight between ages 10 and 15 grow up to become obese 25-year-olds. In November 2009, with funding from the Robert Wood Johnson Foundation, the Institute of Medicine (IOM) formed the Committee on Obesity Prevention Policies for Young Children, whose members will for the first time review evidence on obesity risk factors and health effects in children from birth to 5 years old and identify potential opportunities for intervention in this age group. The committee's first report is expected in early 2011. In a recent study of more than 1,800 children, who were tracked from before birth to age 4, Harvard researchers identified several risk factors for obesity that began in pregnancy or early childhood. They included pre-pregnancy obesity; gestational diabetes; low birth weight and rapid weight gain in infancy; stopping breast-feeding early; introducing solid foods before 4 months; short sleep in infancy; TV in children's bedrooms; and higher consumption of fast food and sugary beverages in childhood. In many cases, these early risk factors were more common in black or Hispanic families than in white families, regardless of income. The findings, first published online on March 1 by the journal Pediatrics, help explain why minority children are at higher risk for obesity early on: 16.7% of Mexican-American children ages 2 to 5 are obese, compared with 14.9% of black children and 10.7% of white children, according to CDC data. The authors emphasize that obesity prevention must not only begin early, but also address cultural issues and include education targeted to specific groups. The good news, says study author Dr. Elsie Taveras, an assistant professor of pediatrics and prevention at Harvard Medical School and a member of the IOM obesity committee, is that many risk factors involve behaviors than can be modified and are not due only to socioeconomic inequalities. "As a pediatrician, it's frustrating for me to think, How am I going to change this person's household income? But what a hopeful message to know that it's actually not that in many cases," she says. A Tipping Point for Obesity? How early in life that prevention efforts need to target children is quickly becoming a central question to childhood-obesity research. One intriguing notion is that there exists an obesity threshold  or tipping point  in infancy, before which a chubby child may be safely steered away from a lifetime of obesity. A small study led by Dr. John Harrington, an associate professor of pediatrics at Eastern Virginia Medical School and Children's Hospital of The King's Daughters, analyzed childhood medical records of 111 obese children and adolescents  those with a body mass index (BMI) equal to or higher than 85% of their same-age peers  in order to determine the age at which children first became overweight.